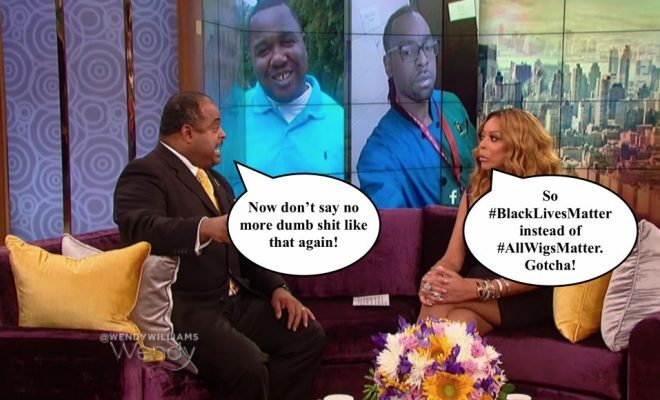 After Wendy William’s ignorant comments about race and HBCUs, she has come under a lot of fire. The fire was turned up a bit more after News One Now’s Roland Martin dragged her to hell and back. Roland schooled her on why her comments were silly and nonfactual. He also said she should stick to gossip magazines and leave the topic of race to those who are informed. The video has been viewed over 6 million times on Facebook alone. Since then Chevrolet has pulled sponsorship from her show. Her most recent episodes have been very ‘black’. The PR machine in motion. They’re trying to clean it up! Wendy tried to clear up her statements and back peddled so hard that she could’ve been joined the Summer Olympics. The struggle back peddling wasn’t enough for some. The dragging continued. In steps, Roland Martin to save the day. Wendy says she reached out to him and had a conversation with him about race and her comments. The conversation went so well that producers begged him to come save her from losing any more sponsors she invited him on the show. Roland Martin knows his sh*t! This was much needed. The timing was everything. He was in the presence of those who need to be educated as well not just Wendy. If she felt comfortable saying that on her show it only shows us who is in her circle. I believe that Wendy felt her remarks was problematic. It isn’t like her to respond to critics. Well now that I think about it, it wasn’t just critics but coins as well. She apologized “I stand corrected.” Apology accepted Wendy. We will review your black card credit limit in 30 days if no more ignorant anti-black comments are made. Do you think Wendy Williams regrets denouncing HBCUs & the NAACP or she shook about them coins being pulled?